A few days ago I shared a post entitled, “Keep Rowing,” based on a novel I was reading at the time. In the story, Eddie Snipes, the author, paraphrased the biblical account of when the apostles found themselves stuck in a boat rowing against a violent storm. The jest of Edie’s message was, God knew that storm was coming, yet He had His disciples row against it anyway. Oh, how we’d like to avoid all the storms in life, but through out Scripture, God promises the storms will come. Our first inclination might be to run for cover, which we should do–but not under a rock. Instead, we must plant ourselves on The Rock–the Creator and our Redeemer. When we do, His strength is made perfect in our weakness. I love today’s devo by Patty Wysong because it reminds me that God’s power and care is not dependent on me–my strength and size. Like the tiny hummingbird flittering through the storm, I too can strand strong because my Savior lives inside me. I love hummingbirds. They constantly astound me. Awhile ago, during a pretty intense storm we stood at the windows and watched the trees whipping and branches falling. And the hummers. Those little birds didn’t let the high winds and sheets of rain deter them—they zipped back and forth between the feeders and the trees, barely fazed by the storm. Both hummers kept flying until they were able to latch onto something. Then they were back to the feeders for another snack. Their persistence in the face of the storm wowed me. And shamed me. How many times do I get a little wind in my face and decide it’s time for me to hunker down? And that’s not even storm winds. In the storms of life I tend to head for my rock—the one I like to hide under. But that’s not the rock we’re supposed to run to. When the storms of life come, we’re to keep flying and get to our Rock. Yanno, our ROCK: Jesus. When we run to that Rock, we can take refuge—hide—there with Him. That’s very good news to me because I’m a hider. Knowing that I can run to my Rock and crawl under is so very comforting to me! When life’s storms start howling, I can face into the wind and keep flying, just like those little hummers did, and fly back to my Heavenly Father. There, with the God of all comfort 2 Corinthians 1:3 I’m safe and secure under His wing. Patty Wysong, a home executive with over 20 years of experience, homeschools three of her five children, but don’t let that fool you. She spends much of her time working on what God has placed in her hand: her keyboard. From the corner of her living room she writes inspirational fiction, devotionals, blog posts, and teaches online blogging workshops. You’ll also find her drinking kool aid from her china cup, preparing for the ladies Bible study she leads, and helping at their church. 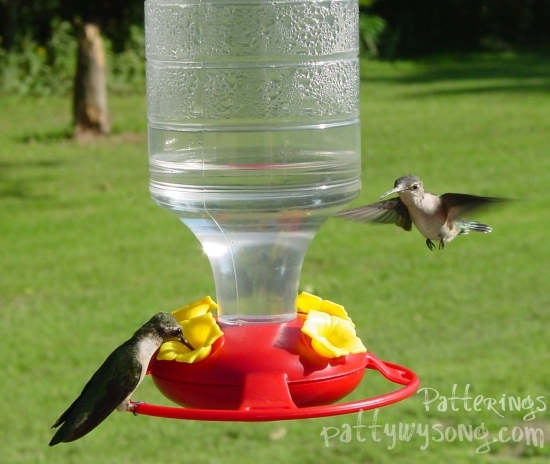 This entry was posted in God's Authors, intentional living, Let's Get Real and tagged God's power, humming birds, Patty Wysong, storm, strength. Bookmark the permalink. Love this devo – and BOTH these ladies! What a great reminder. Thanks for stopping by, Joanne! And I agree! This devo really helped me visualize the biblical truth she brought home! Thanks so much for having me, Jen. Knowing that we can run to our Rock and crawl under is AMAZING! Thanks for this excellent devotion. Blessings! Wonderful inspiration! So thankful He is our Rock! Amen, Rita and Donna! An unmovable, unshakeable constant who will always be there to carry us through whatever storm comes our way!